Whether it is for special occasions, holidays, or just anytime you want flavor with a twist, Charlie’s Pride has something mouth-watering for you. From Prime Rib with au jus, to Roast Beef seasoned with distinctive spice blends from around the world, you will find just the right item for that special meal. You’ll want to check back with us often, as our culinary experts are always creating new recipe ideas for your enjoyment. 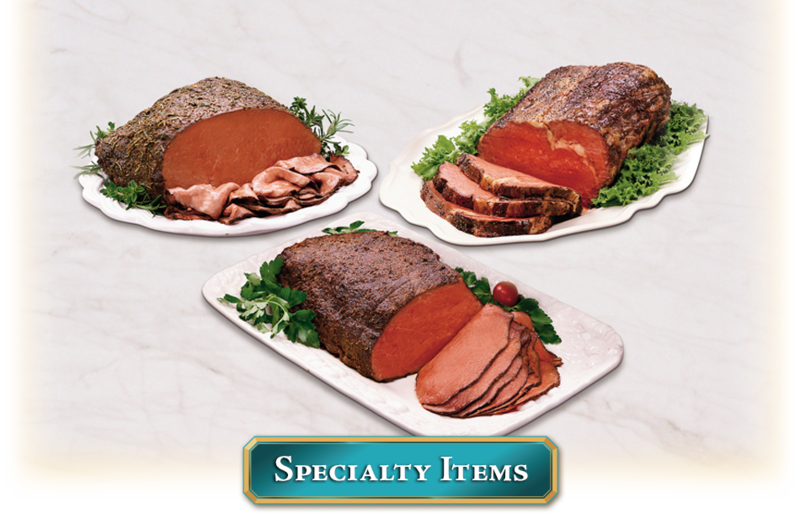 You can feel confident that you have chosen the finest assortment of specially prepared meats. Available with a 10% solution added. Sold whole (10-18 lbs). Can be ordered with a 2″ lip, 1″ lip, or lip off. Available Dry Pack or with Au-Jus. Pre-cooked for the holidays. Packaged in a festive red bag. Available with a 10% solution added. Sold in 4-5 ½ lb. pieces. Can be ordered with a 2″ lip, 1″ lip, or lip off. Available Dry Pack or with Au-Jus. Available non-injected, seasoned (back-to-beginning weight), with a 10%, 15%, 20% solution, or with isolated soy protein added. Sold whole (8-12 lbs) or deli-faced (4‑6 lbs). Lean, tender and juicy, seasoned with a special blend of Italian spices. Available non-injected, seasoned (back-to-beginning weight), with a 10% solution, or with isolated soy protein added. Sold whole (8-12 lbs) or deli faced (4-6 lbs), or in quarter-piece chubs (2-3 lbs). Also available in Eye of Round and Bottom Round Flat. Lean, tender and juicy, seasoned with a special blend of Cajun spices. Available non-injected, seasoned (back-to-beginning weight), with a 10% solution, or with isolated soy protein added. Sold whole (8-12 lbs), deli-faced (4-6 lbs), or in quarter-piece chubs (2-3 lbs). Eye of Round and Flat are also available. Visit our ENTRÉES page for a full selection of our ready-to-heat-and-eat entrée items. With varieties like Beef Brisket in Barbeque Sauce, Carnitas, and Chicken Teriyaki, they’re sure to be welcome additions to your dinner table.